Holy Cross Hill (in English) is more commonly known to locals as Parukářka. 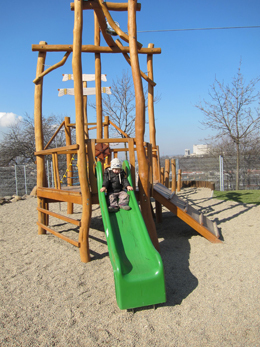 This park is in the Heart of Zižkov and at the same time is high above it, offering fantastic views of the city. 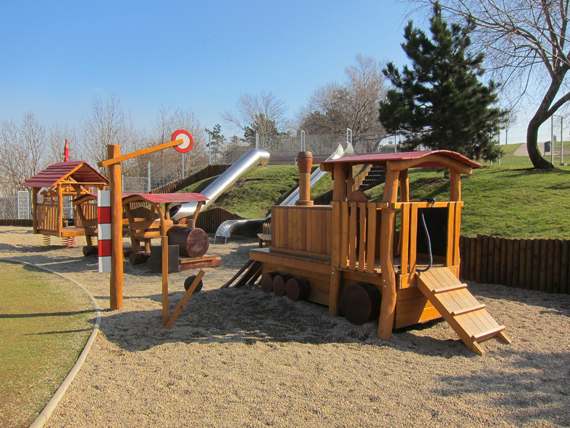 Since September 2010 it has a great new playground that your kids will love. The easiest way to get there is to find the pedestrian bridge behind the Olšanské Hotel at Olšanské Náměstí. If you have a pram then zig zag up the bike path, otherwise take the stairs right to the top of the hill. 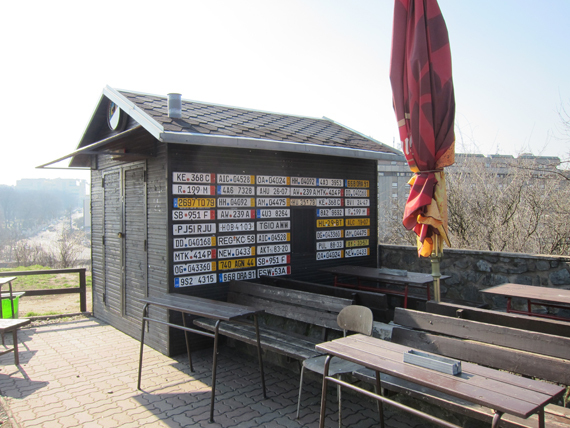 You will pass a famous little pub called Parukářka, which survived demolition by the local council through an active campaign by locals to keep it going. It’s a great spot for beer and snacks with a view. Families are more than welcome and the pub often holds special events for kids eg. Mikulaš parties. 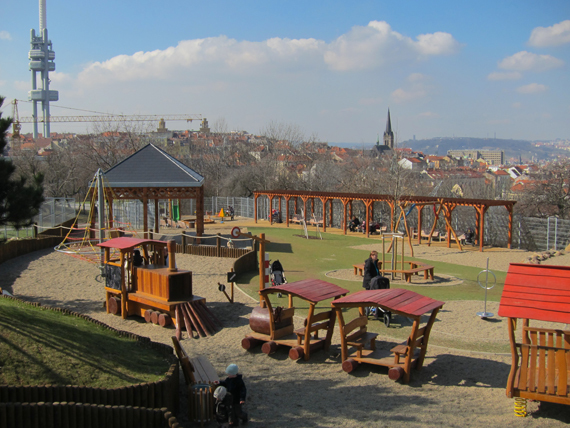 Just beyond the pub is Prague 3’s newest playground. 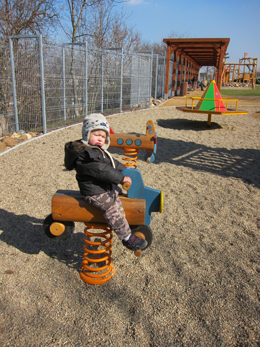 Surrounded by a large fence to protect it from vandals (the playground is without security), the equipment is sparkling new and in good order. Most pieces are made of wood and the landscape design has been very thoughtful; a mix of grass, pebbles, wood and rocks make up the grounds. 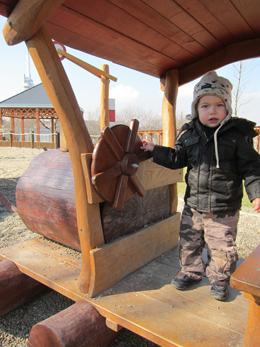 Kids were enjoying exploring the rolling space and textural feel of the landscape just as much as the fun equipment. Highlights for Ari were the big locomotive and a smaller train pulling carriages, he also adored two massive stainless steel slides set into the hill which he climbed and then shot down at quite a speed - he being still only 1! For other kids a pirate ship with slide and zip line attached and a house on springs were popular. 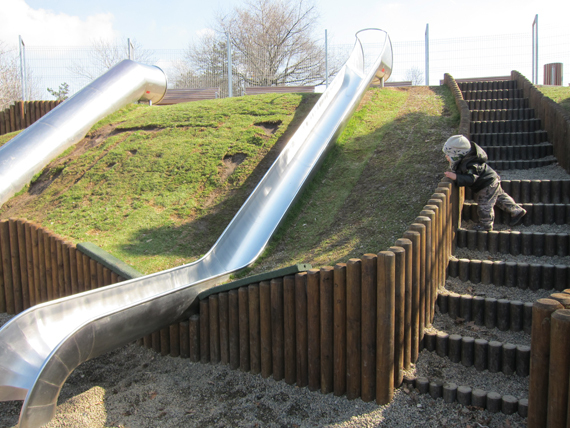 There are also many climbing frames, a roundabout, regular swings (but not for baby) and a sandpit. There is heaps of bench seating and the playground is drenched in sun (when the sun is out), this is ideal for most months except the scorchingly hot days - there are a few trees here but not enough to offer much shelter. There is also an undercover area possibly to be used for outdoor performances, this would also come in handy in the event of rain. One down side is that there are no toilets, you will need to go to the toilets at the pub which opens at 2pm in Summer and 4pm at other times of the year - so not really convenient. 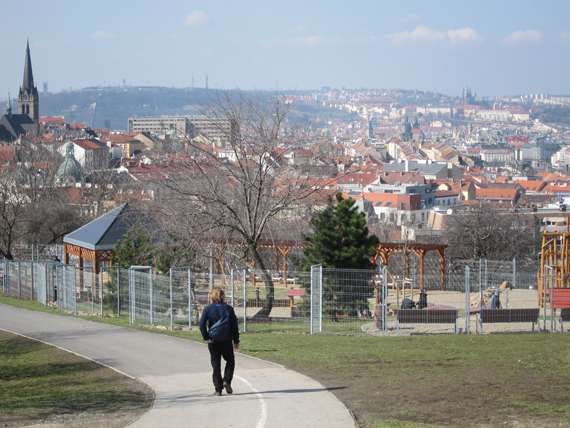 The views from the playground and the hill are beautiful and it’s very interesting to see Prague from this angle. Despite the busy location you are so high above the traffic and chaos that the only noise during my visit was that of church bells and occasional construction noise. Also worth noting is the various bike paths that cover the hill so it’s quite a good spot to set the kids loose on their bicycles. DIRECTIONS: By Tram: Take tram numbers 5, 9 or 26 to tram stop Olšanské Náměstí and walk past Olšanské Hotel into Prokopova making sure the hotel is on your left, take the pedestrian bridge over the street and into the park. By Metro: Closest metro is A line to Flora, walk down Jičínská and cross traffic lights to park (about a 10 to 15 minute walk). By Car: Paid parking available in Olšanská.